Houzz Editorial Staff. Home design journalist writing about cool spaces, innovative trends, breaking news, industry analysis and humor. 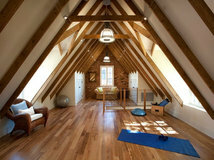 Looking for some great ideas for your home? How about a voice-activated assistant that will give you a weather update while you pour coffee into a preheated mug from a warming drawer? Not your style? No worries — there’s something for everyone in this preview of 2017 design trends. 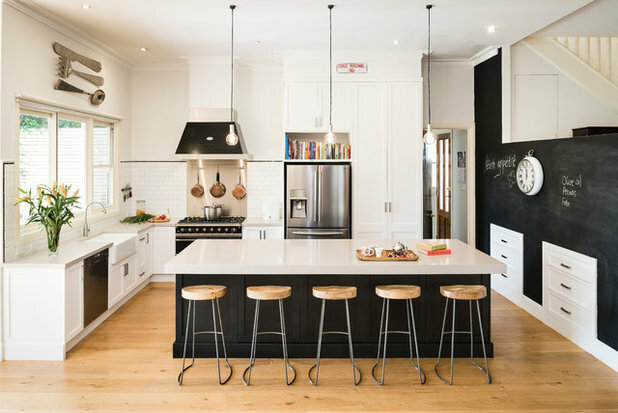 We plowed into Houzz data, sifted through popular photos and articles, and talked to industry leaders for this look at 28 things we think you’ll be seeing more of in the home in 2017. 1. Satin brass. 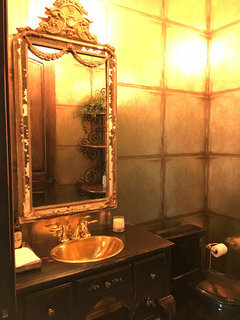 Brass finishes have been making a comeback in recent years, cherished for their ability to bring shiny golden tones to a space without the high price tag. 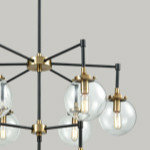 But more recently, designers like Elizabeth Lawson have been turning away from the reflective finish of polished brass and embracing satin or brushed brass, which is more muted and warm. 2. Voice-activated assistants. There’s been a lot of talk about voice assistants in the home. It’s something Shawn DuBravac, chief economist of the Consumer Technology Association, which puts on the Consumer Electronics Show every year in Las Vegas (Jan. 5 to 8, 2017), says will be big in 2017. Amazon’s Alexa, which is enabled in the Echo Dot shown on this side table, acts as a voice-activated interface for many smart home devices. Google Home’s voice assistant launched about a month ago. These devices work through activation phrases like “Alexa” or “OK Google.” The devices, placed throughout your home, are always listening in somewhat of a dormant state. Say the activation phrase, and the device fires up and awaits your command. Ask it to give you the weather or play a song from Spotify or dim your lights or power up the hot tub. 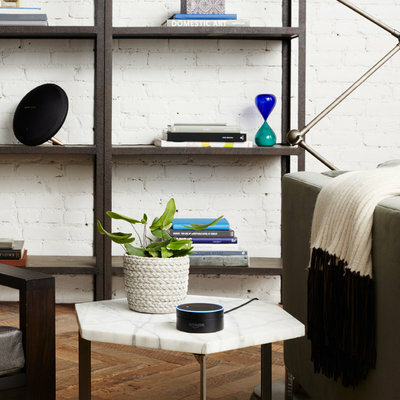 Early last year, Amazon opened its platform to third parties and has since added thousands of integrated features from smart home companies like Lutron, Crestron, Philips Hue, Wemo, Honeywell, Nest, Samsung Smart Home to other services from Uber, Domino’s, NPR and more. Google Home just launched its voice-activated assistant about a month ago, and DuBravac says he expects the company to open the platform to third-party companies soon. 3. Vanity conversions. 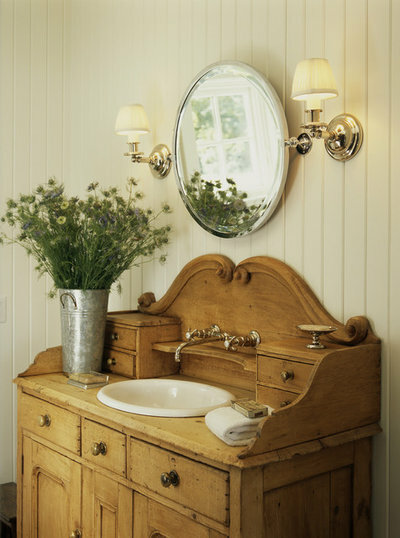 If you’re having trouble finding the right premanufactured vanity for your home, try thinking outside the cabinet box. Many savvy homeowners are finding chests of drawers, old file cabinets, vintage consoles and more, and converting them into one-of-a-kind vanities. 4. Hardworking kitchen storage walls. 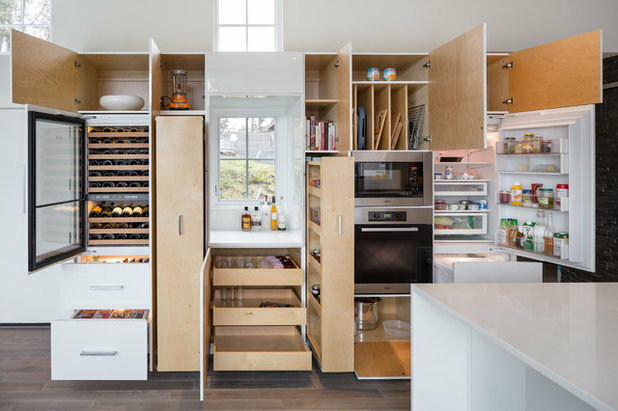 In search of more open space, many homeowners and designers are doing away with expanses of upper cabinets and pushing all that storage onto a single hardworking wall. 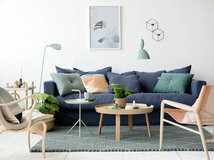 This one-stop hub frees up the rest of the space to create a breezy look. 5. White with off-white. There’s just something refreshing about a room bathed in white. But when done in one stark white tone, things can start to feel clinical. Balancing a white palette with creamy off-whites and natural linen hues creates a breathtaking look that can be rich with character. 6. Greenery. 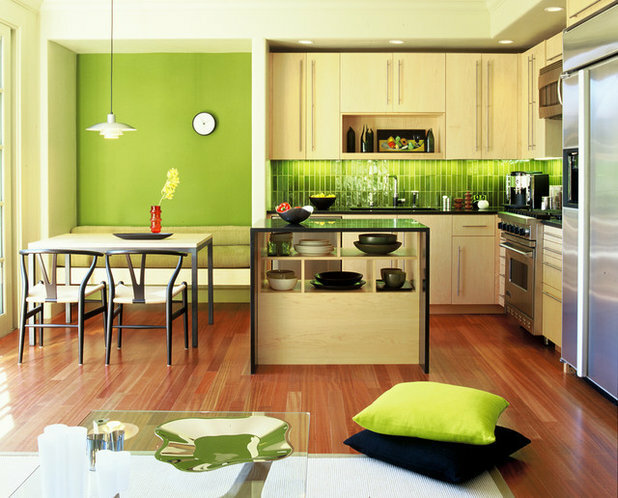 Pantone’s verdant color of the year for 2017, Greenery, seems to be an instant hit for those looking for a revitalizing, back-to-nature hue that brings zest while still managing to work with warm wood tones. 7. Splurging on laundry rooms. Everyone knows that kitchens and bathrooms get the big remodeling dollars, but many homeowners are seeing value in making every space look great. And laundry rooms in particular are seeing more love. 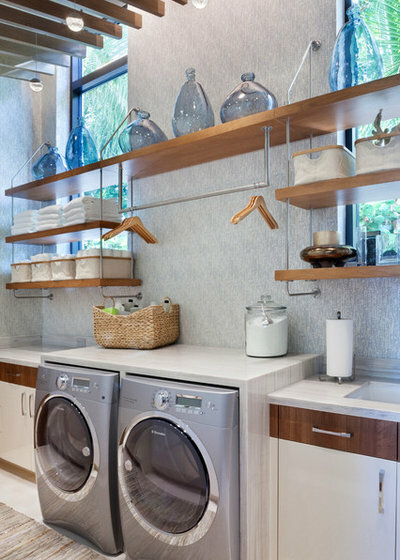 Design tricks to bring in more light, smarter storage and better function resonate with homeowners who realize that since they spend a lot of time doing laundry, why not do it in a space that makes them feel good? According to the 2016 Houzz & Home Report, people remodeling their laundry rooms of 150 square feet or more will spend an average of $2,700. Take away appliances, and that’s a sizable budget to splurge on tile and other details. 8. Splurging on entryways. 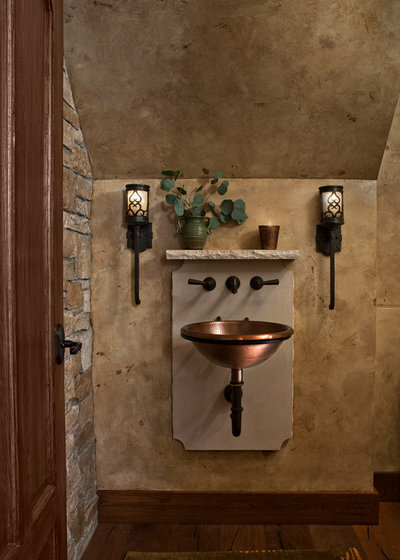 The entry, like a powder room, is a compact place where you can have fun with design without blowing a budget. Homeowners will spend on average $2,500 to make over their entryway or mudroom that’s 150 square feet or more ($1,400 for a space that’s less than 150 square feet), according to the 2016 Houzz & Home Report. Sometimes all it takes is a small area to feature a fun piece of wallpaper, a statement mirror or a narrow table with a tray for shoes underneath. After all, first impressions matter. 9. Outdoor-feeling indoor showers. An outdoor shower is highly desirable but not practical year-round in most areas of the country. 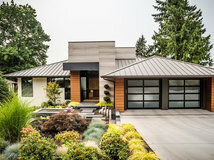 To get around the weather dilemma, designers and homeowners are looking to intimate courtyards and strategic site placement to create bathrooms that connect deeply to the outdoors while still maintaining privacy. 10. Counter-depth fridges. 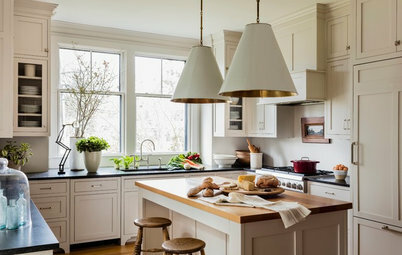 For small to modest-size kitchens, remodeling is often a game of inches. Counter-depth refrigerators sit flush with adjacent cabinetry and countertops, freeing up just a bit more space while creating a streamlined look. 11. Between-studs storage niches. 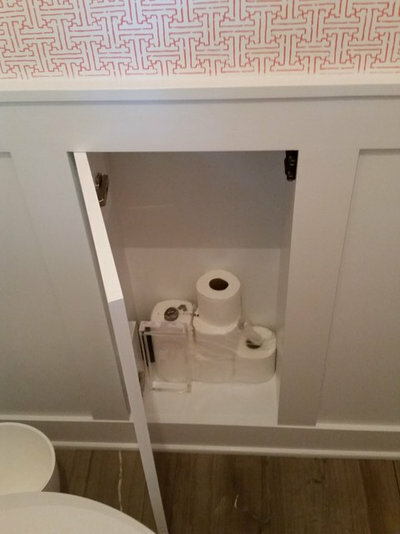 Here, designer Robin Schwadron carved out space for hidden toiletry storage behind a wall panel. 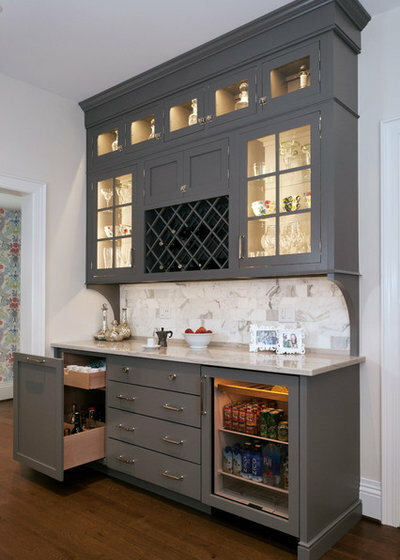 Designer Teresa Buchanan made extra storage and display space with this recessed niche. 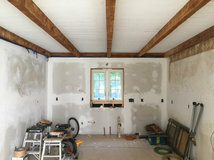 And here homeowner Joanne Payling had her contractor build a cabinet between the wall studs for cleaning supplies, extra toothpaste and soap, and more. 12. High-tech toilets. 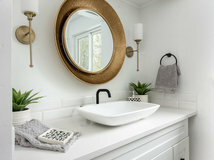 Of the homeowners who are upgrading their toilet during a remodel, 20 percent will choose a model with at least one high-tech feature, according to a 2016 Houzz study of U.S. bathroom trends. 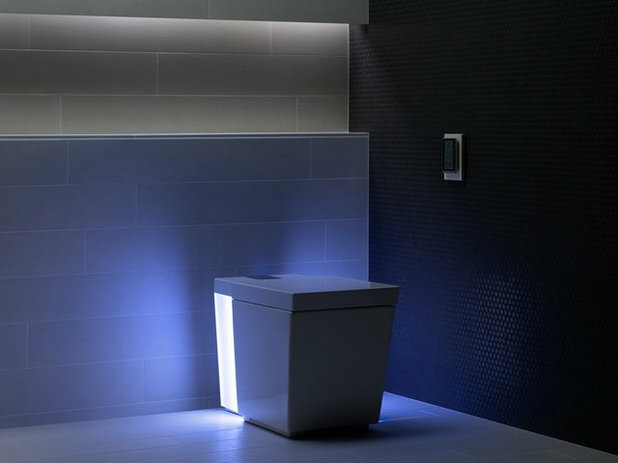 Some of those features include self-cleaning, overflow and anti-clog protection, motion-activated seat and cover, built-in nightlight (as shown here), heated seating, self-deodorizer, and hands-free flushing. 13. Black steel-and-glass doors. 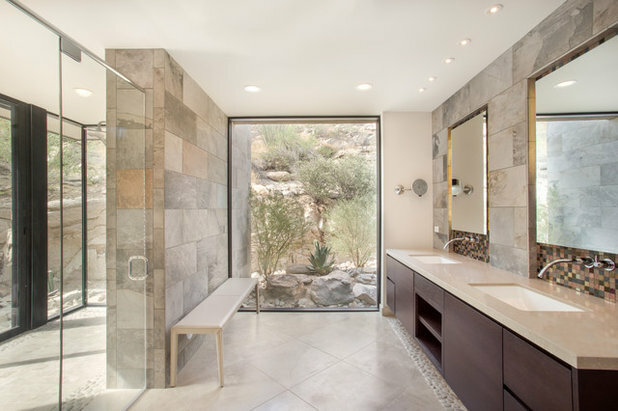 These glass-paneled and steel-frame doors are great for dark entryways that could use some natural light, and they make a statement for shower doors when frameless glass just doesn’t cut it. 14. Contrasting islands. 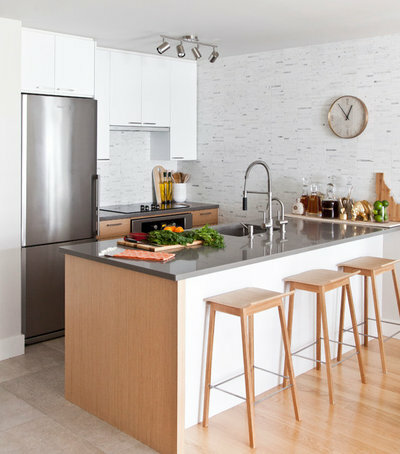 When it comes to cabinets and backsplashes, the color white dominates in kitchens. 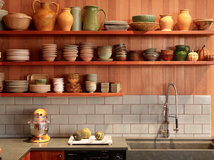 That’s according to a recent Houzz kitchen study. 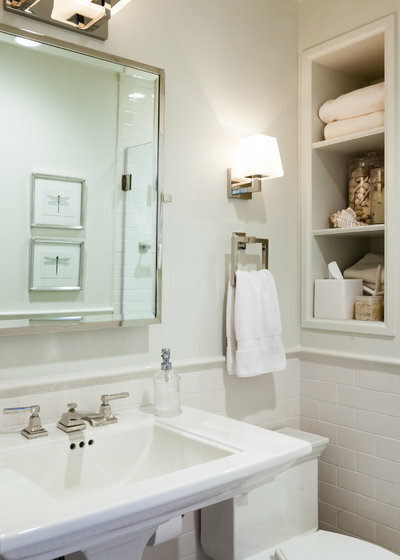 In larger spaces with islands, a white-on-white scheme can come off as too sterile-looking. Painting islands in darker colors helps bring contrast and balance. 15. 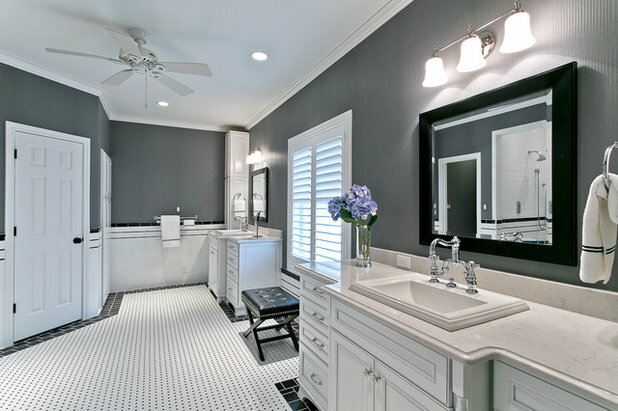 Wainscoting in bathrooms. 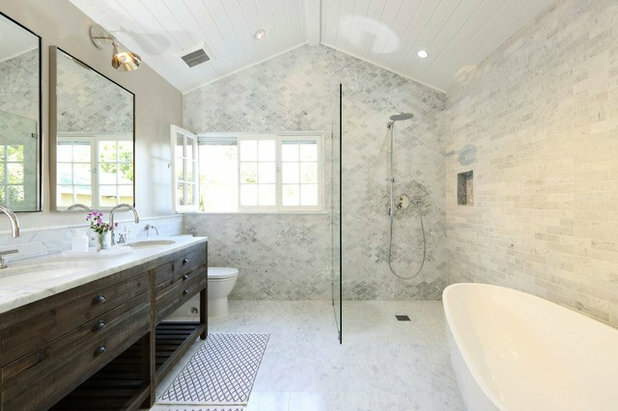 Twenty percent of bathroom remodelers will choose painted wood panels in their bathrooms, according to the Houzz bathroom survey. 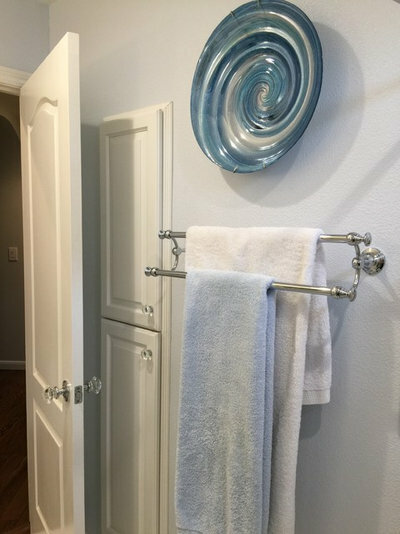 Whether it’s traditional wood wainscoting or tile with a chair rail to break up the room, this design feature is a terrific way to add interest. 16. Graphic floor tile in kitchens. 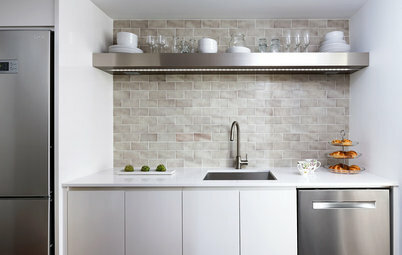 Sometimes wall space is nonexistent in a kitchen, which diminishes the opportunity for a standout backsplash. 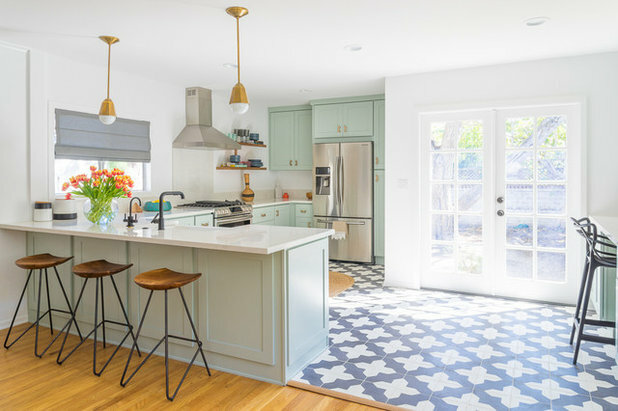 To keep the airy feeling of your kitchen but still deliver visual impact, look to graphic floor tile, like the black-and-chalky white cement tile with a Moroccan-style pattern shown here. 17. 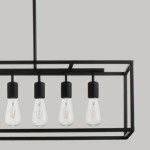 Playful bedside pendant lights. 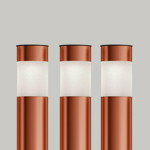 Forget boring old table lamps. 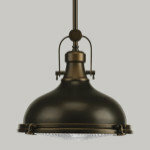 Pendant lights free up bedside space for nightstand essentials and are especially helpful in small rooms. 18. Kitchen entertaining hubs. 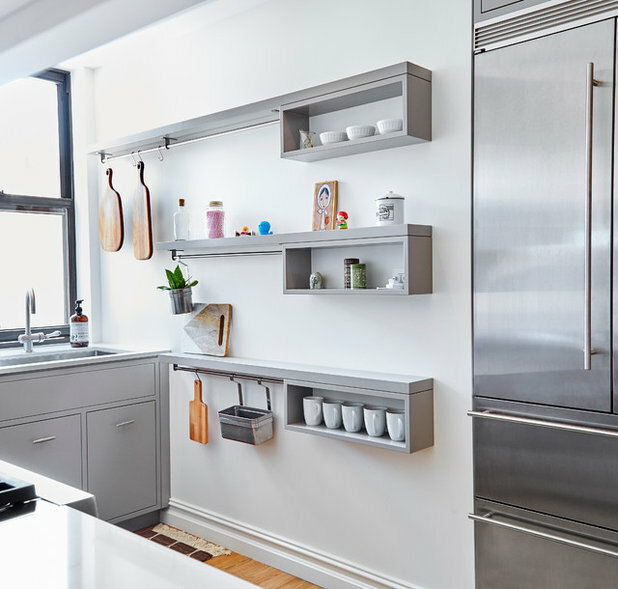 If you’re lucky enough to have a spare wall in your kitchen, you may have debated about what to put there. Multipurpose is the name of the game, with designers looking to high-efficiency design that produces maximum function and style. Custom cabinets can transform a small wall into a storage and function workhorse, turning these previously cast-off areas into coffee and beverage centers, extra prep space, command and message kiosks, and much more. Meanwhile, not skimping on design bears merit too. Backsplashes, glass-fronted cabinets, thoughtful lighting and elegant materials make these walls worth looking at. 19. Amped-up coffee stations. If you thought people couldn’t get more pumped (make that double-pumped?) for coffee, you might be surprised. With 10 percent of homeowners adding built-in coffee stations, according to the Houzz & Home survey, the upgrades being offered are getting hotter all the time. How about a dedicated warming drawer for your mugs, as seen here? Or storage carved out specifically for those Nespresso or Keurig pods? 20. Romantic bedroom colors. 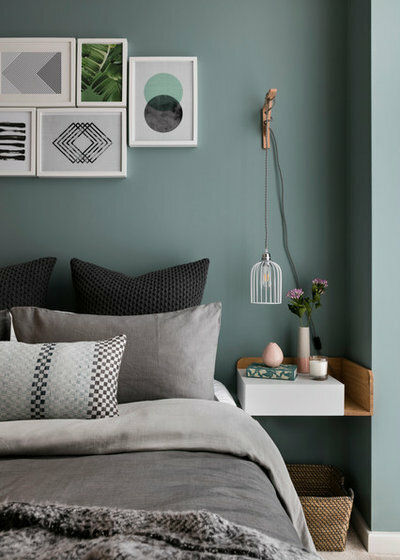 Most homeowners strive for a calm and cozy bedroom by sticking with walls painted in soothing blues, grays or yellows. But according to a recent Houzz survey, intimate or romantic is the third-most desired atmosphere for a master bedroom after calm and cozy. 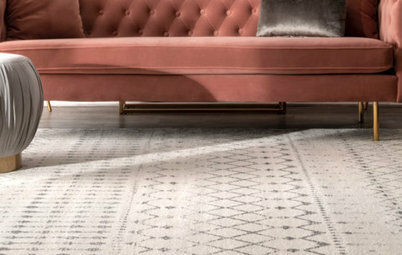 To achieve this mood, look to colors like raspberry pink, deep ruby red, caramel and even black. 21. 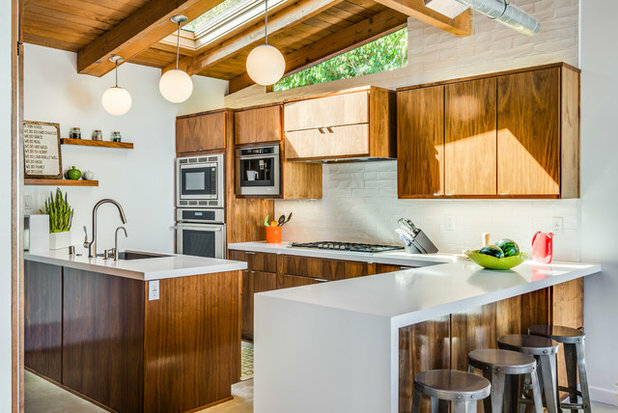 White-and-wood kitchens. 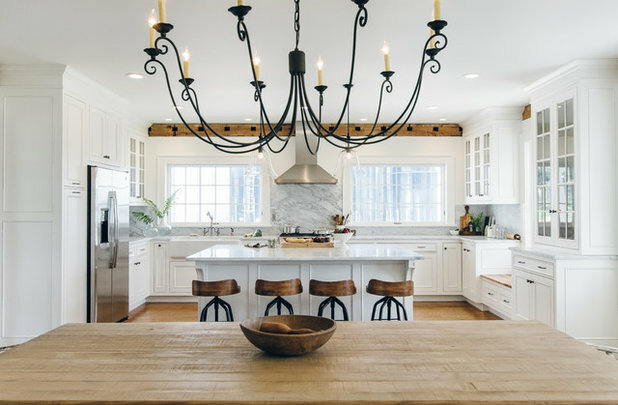 To keep the all-white kitchen look from becoming too cold, designers and homeowners are introducing wood accents to help break up the look visually and provide much-needed warmth. 22. Warm wood cabinets. 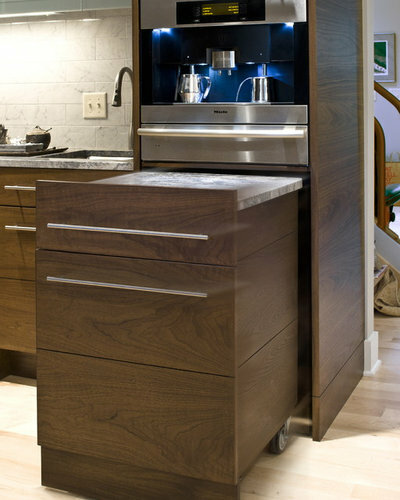 Taking that concept a step further, warm wood cabinets in modern styles are gaining in popularity. 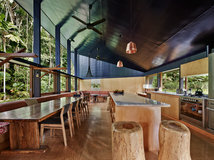 These aren’t the honey-colored, off-the-shelf cabinets from the 1990s, but rather clean-lined, beautifully stained versions that celebrate various wood grains and species. 23. Perked-up side yards. Side yards get a bad rap. Often shaded, noisy from the air-conditioning unit and relegated to a holding area for junk you plan to throw away someday, these spaces see their fair share of neglect. 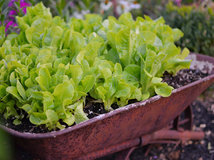 But homeowners use these areas frequently as footpaths around the home, and some are seeing the potential for beautifying their side yards and creating more usable outdoor space. 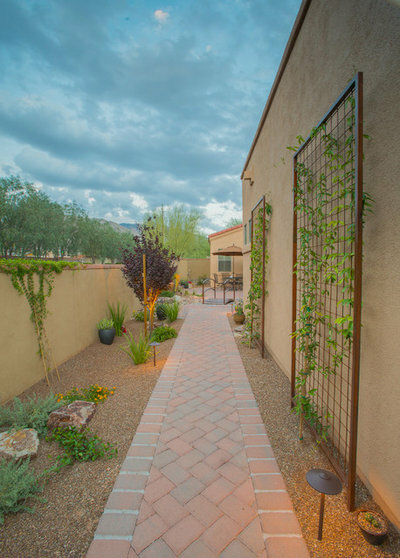 Here, trellises, hardscaping, lighting and low-maintenance plantings put this Phoenix side yard front and center. 24. 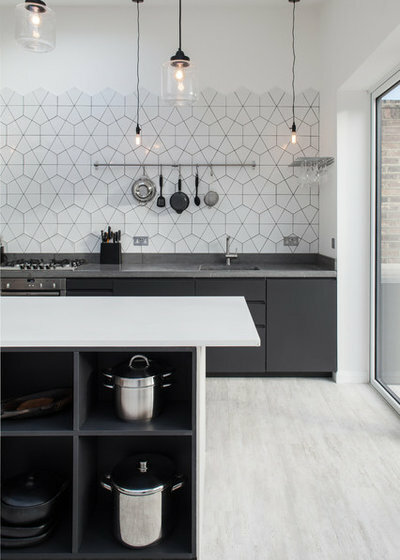 Hexagonal tile backsplashes. 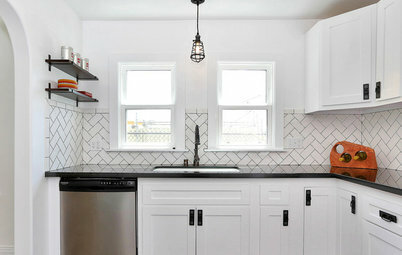 If you’re looking for a break from the rectangular subway tiles or small square mosaics that seem to show up in almost every kitchen, then it’s time to think geometrical. 25. Walls of tile in bathrooms and kitchens. Many homeowners are eschewing the typical above-the-countertop, below-the-cabinets backsplash format and going a bit more dramatic with full floor-to-ceiling, wall-to-wall tile coverage. 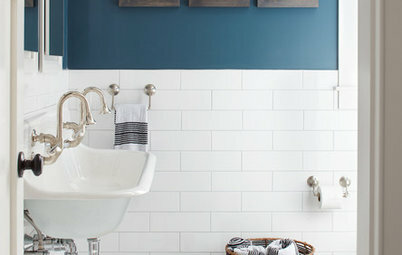 In bathrooms, tile is going everywhere. 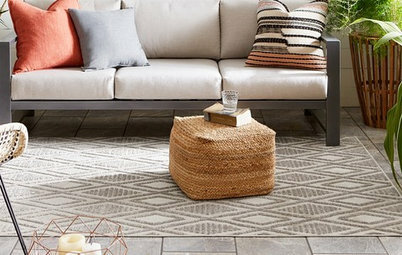 Many designers and homeowners find that it’s a minor splurge to buy enough tile to cover the walls of a relatively small or medium-size bathroom or kitchen. 26. Dutch doors. Dutch doors let in breezes and light while keeping pets and small kids safe. 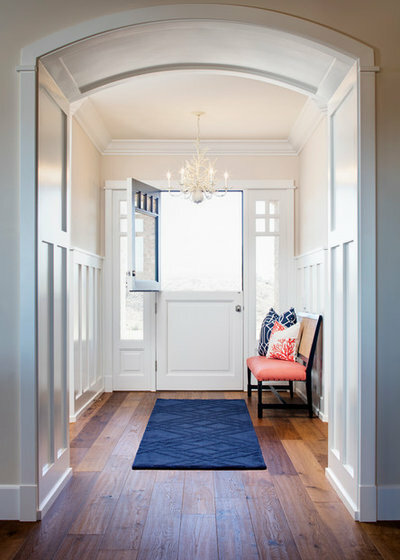 We’re seeing these doors pop up in everything from kitchens to entryways. 28. 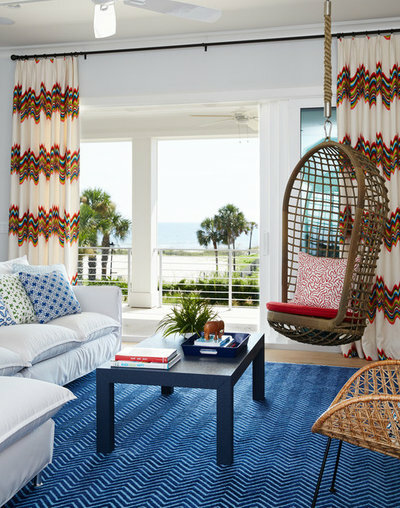 Hanging chairs. Although these have been around for a while, they’re popping up more lately, and not just in living rooms. 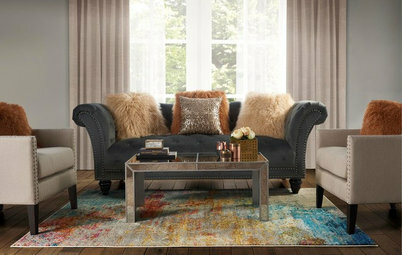 They’re a great way to add an extra seat with a fun statement to a room. 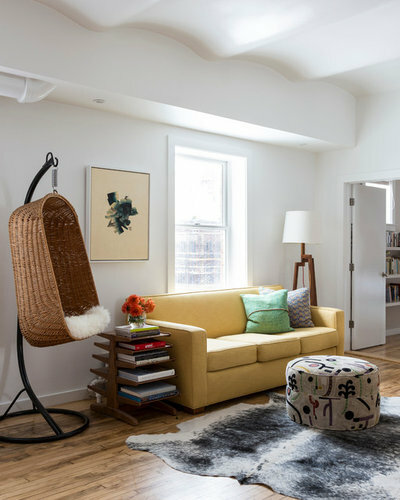 Not keen on anchoring a hanging chair in your ceiling? Look for a stand model like this one. Your turn: What’s big on your design list for 2017? 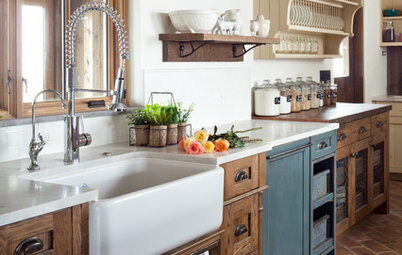 Contractor Grade Countertop Support Bracket, 12"
Vintage consoles and dressers, converted to single or double (his'n'her) bathroom vanities -- sink, faucet, drawer modifications, all included. 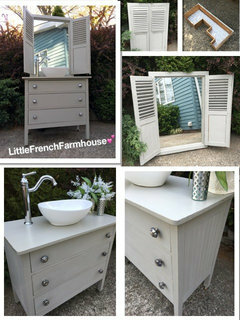 Go to: www.LittleFrenchFarmhouse.com They do beautiful, all-custom conversions, for example this black French vanity console, and this vintage beachy style. 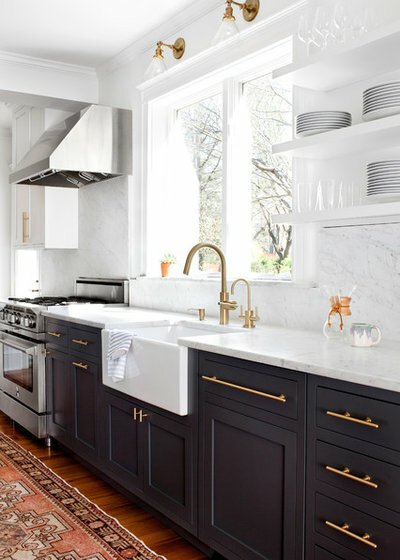 My favorite look is an antique rug with white marble, dark cabinetry and satin brass in the kitchen! LOVE the mix.